After you've signed up to be a coach, you can edit your Coach Profile page. You can also access this by tapping on your profile icon or Me and going to Coach Settings. Once you're on the Coach Profile page you can begin making edits. 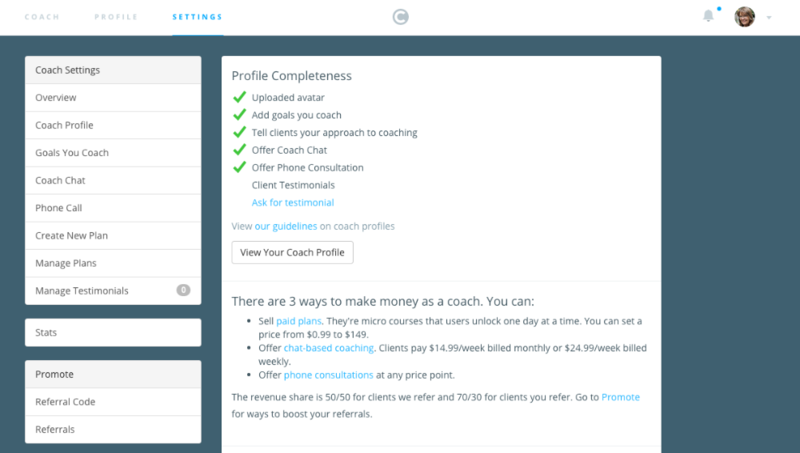 Your coaching profile page has several options along the left. 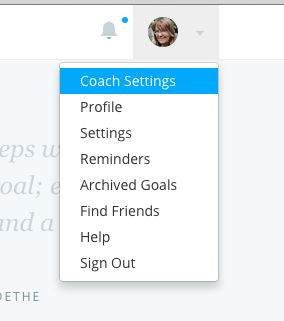 Use them to update the settings on your account: your photo(s), goals you coach for chat, whether you're currently taking chat or phone clients, and other options for coaching and how your profile appears. You'll also notice an option for managing testimonials that clients leave for you, and a URL to share with anyone who might add a testimonial. Don't forget the options under "Promote" — you'll find your referral URL and a badge you can add to your web site there!